Carnival Cruise Lines’ newest ship, the 130,000-ton Carnival Magic, was officially named in a shipboard ceremony in Venice, Italy, earlier today by godmother Lindsey Wilkerson, a former patient at St. Jude Children’s Research Hospital who is now serves as an employee and an ambassador of the organization. Hosted by Senior Cruise Director John Heald, the naming ceremony began with a preview of the line’s newest production show, “Destination Unknown.” The spectacular magic revue served to bring Carnival President and CEO Gerry Cahill to the stage as he arrived via helicopter, one of the many illusions that are featured within the new show. Then, with the assistance of Carnival Magic Captain Giovanni Cutugno, Wilkerson offered the ship and the crew her best wishes and pushed a custom-designed button that rested on a podium resembling the line’s iconic winged funnel thus releasing a bottle of champagne across the vessel’s bow. During the ceremony, Carnival presented St. Jude with a $50,000 donation, continuing the line’s ongoing partnership of the organization, one of the world’s premier centers for the research and treatment of pediatric cancer and other catastrophic diseases. Through various on-board fundraisers, Carnival endeavors to raise $3 million for St. Jude over a three-year period, as part of the cruise line’s Care To Play program. 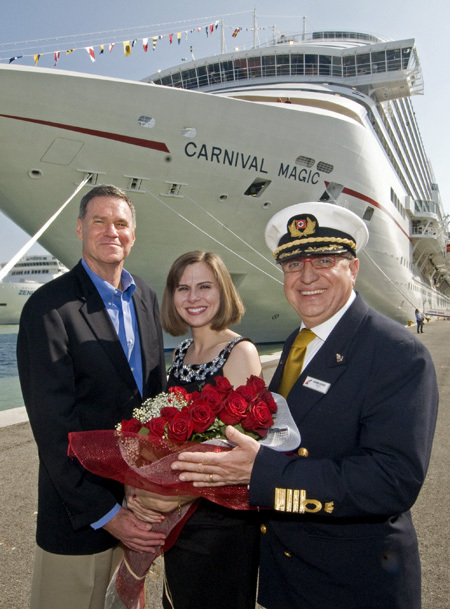 Following the naming ceremony, Carnival Magic embarked on its inaugural nine-day cruise from Venice to Barcelona, positioning the vessel for a series of seven- to 12-day Mediterranean cruises through October. The ship will then sail on a 16-day transatlantic then launch year-round seven-day Caribbean cruises from Galveston, Texas, in November.